Rotator Cuff injuries are unique injuries. They may be caused by trauma, such as a fall or car accident, or can be more insidious. When the shoulder starts becoming painful during overhead activities, it can be due to bursitis developing in the shoulder. There are many bursas in the body. The one in the shoulder that is most commonly affected is the subacromial bursa. It lies on top of the supraspinatus muscle and tendon unit and below the acromion. Normally, it is quite flat and acts as a sliding buffer between the bone and the tendon. It can becoming inflamed due to many reasons. One of those reasons is a rotator cuff tear. One of the more common types of rotator cuff tears is the supraspinatus tear. It is the one responsible for starting shoulder abduction. Shoulder abduction is when the arm is brought from the side of the body directly to the side, like when you are performing a star jump. There are many causes of supraspinatus tears. Long term overhead activities, trauma, and even smoking have been implicated. It has been found that a large percentage of people will have supraspinatus tears that developed over many years. The tears can be totally asymptomatic, meaning that they do not cause any pain. There is no requirement to perform surgery if they are not painful, or if strength has not been affected. 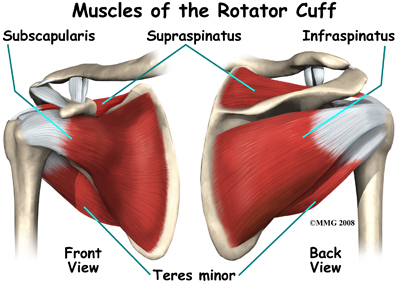 The other muscles that make up the rotator cuff include the subscapularis, infraspinatus and teres minor. 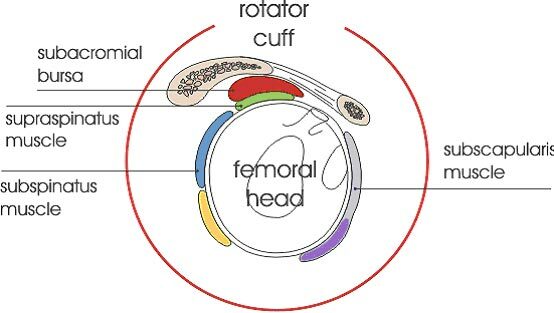 Of these, the infraspinatus and trees minor act to keep the humeral head in the correct position in the shoulder by stopping the head from being pushed up into the acromion and bursa. They are external rotators of the humerus, acting to bring your arm out, as in the motion during hitting a tennis ball. They are often spared in rotator cuff injuries. Large injuries can cause damage to the infraspinatus, and then the trees minor. The subscapularis sits on the front of the shoulder. It is very large as a muscle and attaches to the lesser tuberosity, and right next to the long head of the biceps tendon. Here, it acts to internally rotate the shoulder. This movement can be simulated roughly by patting your own stomach. Its strength is tested by placing your hand behind your back and trying to lift it off, pushing back, away from your body. Your surgeon will test this to see if it is functioning correctly. It is one of the more important muscles in the shoulder. Ruptures or injuries that cause it to tear from its origin can result in dislocation of the shoulder, instability of the biceps tendon from its groove, and lack of strength. The subscapularis tendon can be injured during trauma, and if so, almost always requires early fixation. This is usually performed via an open approach due as it is difficult to repair it arthroscopically, safely. The Axillary nerve runs directly in line and below the subscapularis tendon and can be injured if it is not protected during surgery. The Axillary nerve supplies the deltoid amongst other things, which is very important for shoulder function. Tears of the rotator cuff can be partial or complete. Partial tears occur on either the articular side or the burial side. When you read an ultrasound report, they often mention whether the tear is on one of these sides. When a tear is incomplete, it usually doesn’t require fixation. Incomplete tears do not usually cause the muscle and tendon to retract as there are still fibers left there. However, a tear can cause bursitis which causes pain. Sometimes the tear needs to be completed and then fully repaired. This would be after failed non operative management. Dr Chien-Wen Liew believes in a pre-habilitation. This means that in most cases, when your tear has occurred due to work or insidiously, the first step is ensuring that you restore the normal mechanics of the shoulder. When the supraspinatus is torn, this often requires a targeted physiotherapy program. This program utilises special exercises which are very important in ensuring that the correct muscles are strengthened. When ROM and pre-habilitation have been completed, and your shoulder has not fully recovered, Dr Liew will usually perform an MRI to look at the quality of your muscles and tendon units as well as how retracted your tendons are. If a repair is necessary, it is performed via key hole surgery (arthroscopic methods). In some cases, a small incision has to be made to repair the tendon during surgery. This is usually on the side of the arm and is about an inch long. For more information, please contact Dr Chien-Wen Liew to discuss rotator cuff tears. (08) 7099 0188 for all appointments. Thankyou for visiting this website. Please note that the information held within this site and on this page are for educational purposes only. Please consult your doctor or health professional always prior to considering any medical therapy or intervention. If you notice an error on this site, please use our contact form to let us know so we can rectify any issues. All information and graphics on this site are the property of Sempire Designs.